We offer professional advice in the fields of financial strategy and capital markets issues. We customize our advice in a very confidential way and it focused to company owners, founders and management teams. BLAETTCHEN FINANCIAL ADVISORY was founded in summer 2010. Prior our Team worked together at the advisory company Blaettchen & Partner AG for many years. Therefore we have an unique capital market advisory experience in IPOs, bond issues and implementation of management equity programs with more than 50 transactions and several billions EUR issue volume over three decades. Our Company is completely owned by its active partners and is not a part of a financial institution. Hence, we are fully independent and not exposed to any conflicts of interest. We appreciate the high level of trust our clients have in us. 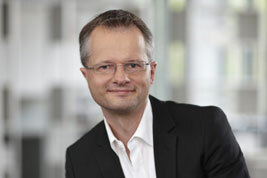 Prof. Dr. Wolfgang Blättchen is founder and Managing Partner of BLAETTCHEN FINANCIAL ADVISORY GmbH. Prior he was Managing Director and founder of the advisory company Blaettchen & Partner. He started in 1985 and has a unique track record as independent capital markets advisor. In this period he advised many successful IPOs and IBOs from German and foreign issuers, complex capital market transactions (SPO's, public takeovers, squeeze outs) and numerous Management Equity Program implementations. 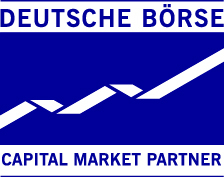 Wolfgang Blättchen is a member of the “Issuer Markets Advisory Committee” of Deutsche Boerse AG, long-time member of the DVFA and temporarily member of its Advisory Board. Wolfgang Blättchen is also a member in Supervisory Boards in public and privately held companies: AIXTRON SE (deputy Chairman and Chairman of the Audit Committee) and PFISTERER Holding AG (Chairman). He is a non-obligatory Advisory Board member of SÜDVERS. He was from 2002 - 2010 Professor at the Faculty I - Taxation, Accounting and Auditing of the SRH University of Applied Sciences of Calw, Germany, from 2005 - 2010 Assistant Dean of the Faculty and from 2012 - 2017 he was Deputy Chairman of the Alumni Association SRH Hochschule Calw e.V. Since 2011 he is Co-Editor of FuS-Familienunternehmen und Strategie and has published various articles and books about stock market, IPOs, takeovers of listed companies an Corporate Governance. Dr. Stephan Mahn is Co-founder and co-owner of Blättchen Financial Advisory GmbH. Advises medium-sized enterprises in their IPO preparations, equity financings, individual capital market strategies and management equity programs since 1991. He was a board member of Blättchen & Partner AG until June 2010. He has managed numerous projects in various industries and situations and published articles in the fields of capital markets and management participation programs. He has studied Business Administration in Germany and in the USA and received a doctor´s degree from Handelshochschule Leipzig (HHL). 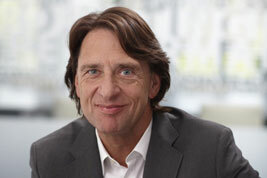 Uwe Nespethal is partner of BLEATTCHEN FINANCIAL ADVISORY GmbH since its foundation in 2010. 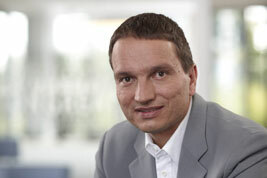 From 1998 until mid of 2010 he worked for Blaettchen & Partner AG as a capital markets professional and project manager. From this time onwards he advised numerous capital market transactions and financial strategy projects. Uwe Nespethal graduated in industrial engineering from Brandenburg Technical University of Cottbus and received a degree as an international financial analyst CEFA/CIIA. He has published various articles about capital market issues. The intention to go public is in general a once in a lifetime highlight for the issuer, the companies´ owners and the founders and has to be prepared and supported carefully. Our core competences are focused on the development of individual capital market strategies for different financing instruments. This process starts from the initial decision to go public, embraces all necessary steps to achieve the IPO readiness, leads to the selection of suitable project partners ("beauty contest") and includes the whole project management. We manage the upcoming conflicts of interest between company owners, financial sponsors, underwriters and the involved advisors. We support our clients to structure and manage a "dual track transaction", that means a complex process in which the shareholders pursue an IPO and a trade sale option simultaneously. 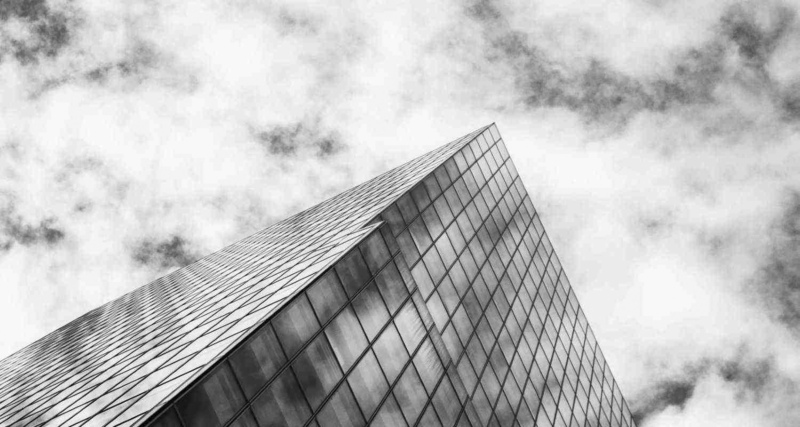 We assist companies in the offering of non listed equity financing instruments such as mezzanine, Pre-IPO private equity finance, warrants and convertibles. Furthermore we are the sounding board for the stock exchanges concerning design and implementation of new capital market services for issuers and investors. 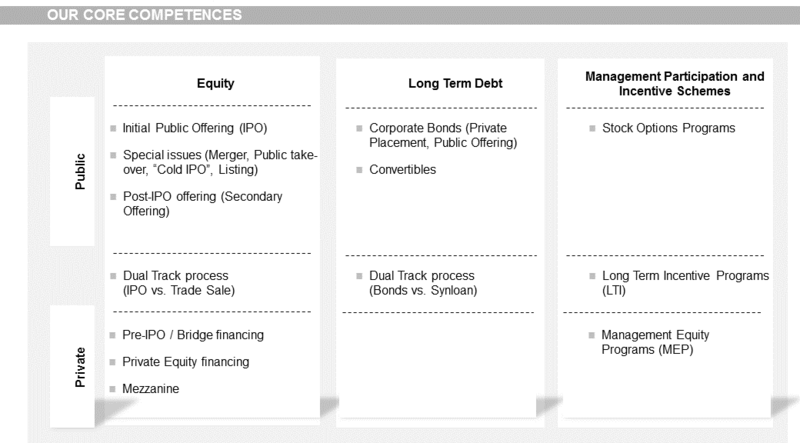 We support our clients to design and implement a "management equity program" (MEP) in a typical LBO transaction. The participants of this program have usually potential to invest a significant amount. Therefore a balanced risk profile and fair conditions for the MEP are essential to reach the long term goals. The upcoming conflicts of interest between the involved parties will be moderated and managed by us. We also help to develop a "state of the art" equity participation and incentive program for employees and managers ("Employee Stock Option Plans" or ESOP) before or after an IPO. Particularly fast growing Tech companies have strong empathies to share the future value creation in an early stage of the company lifetime. Such designed incentive program must be open for the future "exit event" and may not hinder it. This applies in particular to the IPO. Hence, we support clients to restructure existing equity participations programs in a recapitalization situation. We are proud to support the mayor German stock exchanges to design and to implement the innovative market places for listed corporate bonds. We were nominated bondm-FOUNDATION-COACH at the Boerse Stuttgart and are DEUTSCHE BOERSE CAPITAL MARKET PARTNER at the Frankfurt Stock Exchange. In the first step we support you to find the fundamental decision to issue a capital market instrument as a corporate bond or alternative instruments (notes, private placements). Our key point of analysis is the capital market capability of our clients, which will be necessary for a bond issue. As independent advisor we assist our clients to issue a corporate bond. The issue concept can include an "issuer controlled offering" in consideration of several distribution channels. The alternative concept can be a "bank controlled" issue, where the mandated investment bank underwrites and sells the bond by means of a syndicate. We support the client to develop the suitable issue concept, select the professional partners (banks, selling agents) via a "beauty contest" and bring the issuer together with potential investors and intermediaries and negotiate the optimal conditions. Furthermore we assist our clients to execute a "dual track process", in which both a bond issue and alternative refinancing options (credit facility, notes etc.) are simultaneously followed. BLAETTCHEN FINANCIAL ADVISORY supported BIONTECH AG to design and to implement a capital market relatet Employee Participation Program and supported the management board in this context to prepare an Pre-IPO Financing Round (Series A) in a volume of 270 Mio USD. BLAETTCHEN FINANCIAL ADVISORY supported PNE WIND AG to issue a second tranche of its 8.0% corporate bond 2013/2018 (WKN: A1R074) in a volume of 33.7 Mio. € within a private placement. With the reached total bond volume of 100.0 m€ the bonds are to be included in the Prime Standard segment for company bonds on September 19, 2013. Der Corporate Bond Martk 2014 - BondGuide-Special "Anleihen 2015"
from Uwe Nespethal / Prof. Dr. Wolfgang Blättchen in BondGuide Special "Anleihen 2014"
from Prof. Dr. Wolfgang Blättchen / Uwe Nespethal in Going Public Special "Kapitalmarktrecht 2013"
from Prof. Dr. Wolfgang Blättchen / Uwe Nespethal in Going Public Special "Anleihen 2013"
from Uwe Nespethal / Prof. Dr. Wolfgang Blättchen in Going Public Special "Anleihen 2012"
Interview with Prof. Dr. Wolfgang Blättchen and Alexander von Preysing in Going Public Special "Anleihen 2012"
Pursuant to Art. 7 subs. 1 TMG (German Telemedia Act) we, as service provider, are liable for own content published on our website as per general laws and regulations applicable in Germany. However, pursuant to Art. 8 to 10 TMG we, as service provider, are not obligated to monitor transmitted or stored third-party information or to search for circumstances indicating any unlawful activities. That does not affect any obligation to remove or block the use of information as per general laws and regulations. However, any relevant liability may not be assumed until the point of time of obtaining knowledge of any specific violation of law. Once we become aware of any relevant violation of law, we shall remove any such content without undue delay. Our offer includes links to external third-party websites the content of which being beyond our sphere of influence. Consequently, we are unable to assume any liability for such third-party content. As a rule, the relevant provider or operator of the pages assumes responsibility for the contents of the linked pages. At the point of time of linking, the linked pages were reviewed in terms of any potential violation of law. Any unlawful content was not identified at the point of time of linking. However, permanent monitoring of the content of linked pages is unreasonable without any specific evidence of violation of law. Once we become aware of any violation of law, we shall remove any such links without undue delay. The content and works created by the operator of this website are subject to German copyright legislation. Any reproduction, editing, dissemination, and any form of utilisation beyond the confines of German copyright legislation are subject to the written consent of the relevant author or creator, respectively. Any downloads and copies of this website are permissible for private, non-commercial use only. To the extent content published on this website was not created by its operator, third-party copyrights shall be observed. In particular, third-party content shall be identified as such. However, should you become aware of any violation of copyright, we kindly request you to inform us thereof accordingly. Once we become aware of any violation of law, we shall remove any such content without undue delay. The protection of your personal data is of major importance to the operator of this website. We shall treat your personally identifiable data confidentially and in keeping with legal data privacy regulations and the present Data Privacy Statement. As a rule, the use of our website does not require your disclosing any personally identifiable data. To the extent it is necessary to enter any personally identifiable date on our website (e.g. name, postal address or e-mail address) such compilation will, when possible, be on a voluntary basis. The data so compiled will not be transmitted to any third party without your express consent. We should like to note that Internet-based data transmission (e.g. e-mail communication) may be susceptible to security gaps. It is thus not possible to ensure end-to-end data protection against third-party access. Some of our Internet pages use so-called cookies. Cookies do not damage your computer in any way and do not contain any viruses. Cookies have for their purpose to render our offer more user-friendly, more effective and securer. Cookies are small text files placed on your computer and stored by your browser. Most of the cookies we use are so-called 'session cookies', meaning that they will be deleted automatically after your visit to our website. Other cookies remain stored on your end device until you delete them. With such cookies we are able to recognise your browser once you re-visit our website. You can modify your browser preferences such that you are informed promptly before a cookie is stored on your end device to allow storage of cookies in individual cases only, accept cookies in specific cases, or permanently block cookies, and automatically delete cookies once you close your browser. However, deactivating cookies on your end device may restrict your use of the functionalities of our website. Those data are not attributable to any specific person. The data so collected is not merged with other data sources. We reserve the right to subsequently verify such data, should we obtain knowledge of any specific grounds indicating any unlawful use. For reasons of security and protection of transmission of confidential content, such as requests you send to us as website operator, our website uses SSL encryption. You may recognise encrypted connections whenever the address bar of your browser changes from "http://" to "https://" and your browser line depicts a lock icon. Once SSL encryption is activated, data you send us cannot be read by third parties. At any time, you are entitled to request, free of charge, disclosure of your personally identifiable data we store, their origin and recipients, the purpose of our processing your data, as well as rectification, blocking or deletion of your personally identifiable data. For such purpose and for any further questions you might have about personally identifiable data, do not hesitate to contact us at the address indicated in our Web Imprint at any time. DWe herewith object to using our contact details required to be disclosed within the framework of our web imprint for sending us advertising e-mails and information not expressly solicited. The operators of this website expressly reserve the right to take legal action in case of unsolicited sending of advertising information, such as spam.